Huge news from Frankfurt Book Fair; my newest project was acquired by Faber Children’s! Memoirs Of A Neurotic Zombie is a middle-grade series about an OCD suffering twelve year old called Adam Meltzer who rises from the grave to solve his own murder. He teams up with a vegan vampire and a reluctant chupacabra to uncover the weirdness that pervades their hometown of Croxton, Ohio. The project was featured here on the Frankfurt news blog. I wrote a lot of this book at home this summer (Burlington, Ontario, Canada), revisiting my childhoods hangouts, including my school library at Pineland Public School. 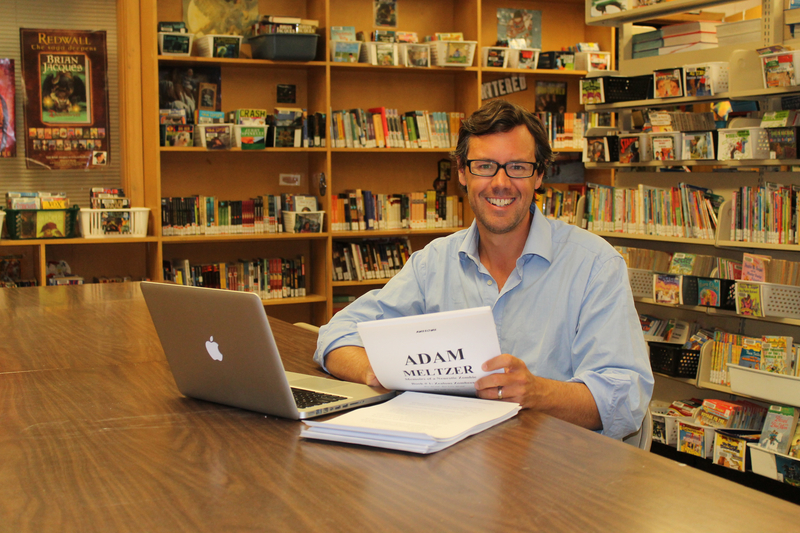 Writing Adam Meltzer in my middle school library. They say you can never go home again, but when writing a book set in the middle school years, it sure does help. Walking around town, I was able to channel the emotional experience of my twelve year old self. While Memoirs Of A Neurotic Zombie isn’t my autobiography, it does drawn on a deep well of adolescent outlook that still lives within my memories. The book doesn’t come out until October, 2014 (though amazingly you can preorder it now here) and I still have a lot of editing to do, but when it’s ready, I hope you love it. If you returned to your middle school years, what kind of book would you write?